Professional ceramic, porcelain, china, sculpture and pottery repair and restoration services for individuals, collectors, antique dealers and museums. We strive for the highest quality and we treat each object entrusted to us with the utmost care. We repair, fix and restore a wide range of materials which include pottery, ceramic, porcelain, china, terra-cotta, clay, stoneware, stone, metal sculpture, plaster, resin, wood and other materials. We can provide different levels of repair for high-end restoration and can propose more affordable options and rates - see more about our restoration and conservations options below. We always do the best we can to be sensible with advising our customers on the best path with restoring (or not) the damaged valuable. 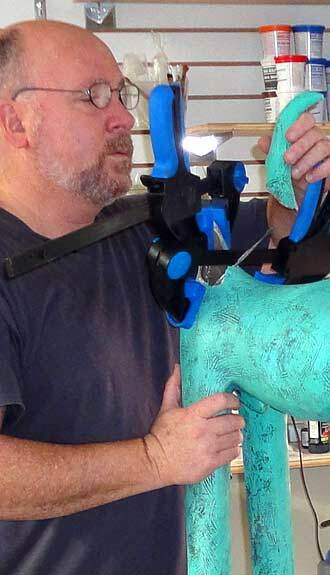 Our repair and restoration services include almost any antique, collectible, art object, statue or sculpture. As our Before and After example page shows, the range of repairs we can perform is diverse - it can be a hairline crack, chipped item or multiple breaks. When items have missing pieces, Lakeside Pottery can match the ceramic material and restore the original look and feel. And when necessary, we have the unique capability, as ceramic artists, of sculpting or taking an impression of missing pieces, reproducing them from clay and kiln firing the duplicated pieces (instead of a Polymer based filler option) to insure uniformity of materials and retain the restored item's value. 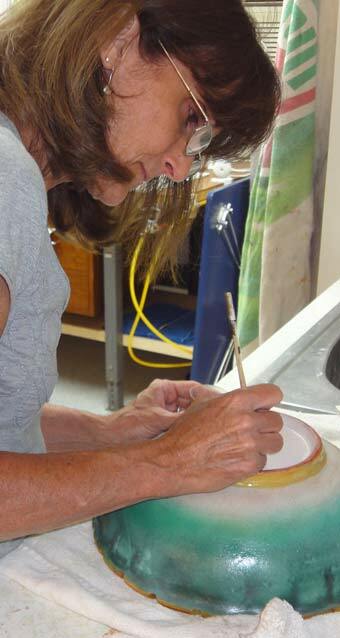 At times, making a Custom Made replica in our pottery studio is a more cost effective option which you may choose. Satisfaction guaranteed: We do not ask for the balance due payment until you are 100% satisfied with the end results (we'll e-mail you pictures for review). Pricing: Minimum charge is $140. Most ceramic and sculpture repairs range from $250 - $400. We require 50% payment prior to restoration commencement. Restoration quotations provided by Lakeside Pottery are valid for 45 days. Schedule / Lead Time: Repairs can take anywhere between 8 to 16 weeks depending on the complexity and time of year. Our official estimate proposal will indicate schedule as it applies specifically to your project. You may request expedited schedule if it is really important to you to receive the item earlier. Getting the item to us: Your valuable can be driven to us during selected days and time or shipped. Most items are shipped to us from around the country and some from other countries. If our shipping recommendations are followed (see link), shipping is safe. To date, none of the items shipped following the given shipping instructions were damaged. We take great care in shipping your repaired piece back to you and have a perfect track record. Is removal of an old repair attempt required? How many breaks, cracks or chips? Are pieces missing? If yes, will we be required to fabricate them? How many shades of colors are required to be matched? What repair type is chosen relative to your budget (see below)? Does the restoration cost make financial sense? Fill out the on-line Restoration Estimate Request Form. Note: We do not estimate and repair functional items such as cooking ware. The repair materials can be effected by contact with, food liquids, cleaning materials and temperature above 150 degree F.
2) MID LEVEL BUDGET (save about 15 - 25% of Best Level cost): This option is similar to the above but surface smoothness and color matching may be less perfect and we pay less attention to bottom and inside of vessels. Choose this option if having a perfect surface area and / or precise color or glaze matching are not that important to you. The difference between Best and Mid level to a casual observer is nominal except for bottom or inside of vessel where less detailed work was implemented. It will still be a very acceptable job. 3) KINTSUGI - translation from Japanese means "golden joinery". 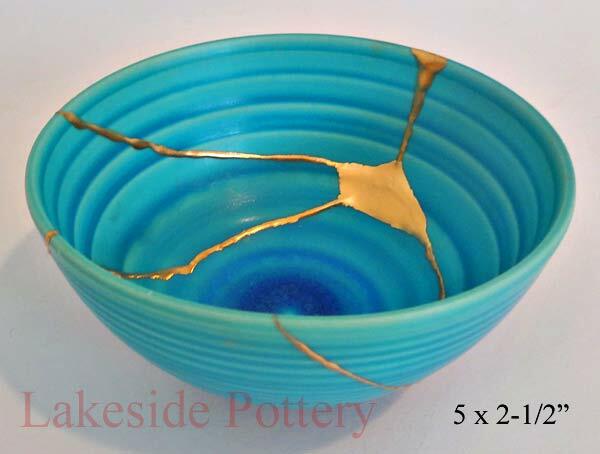 This technique transforms broken ceramic or china vessels into beautiful works of art using gold effect and lacquer / epoxy to enhance breaks or the attachment of shards and in doing so giving an aesthetically pleasing and unique way to repair broken pottery. Gold effect is not the only color of Kintsugi repair. Other powdered metals can be used as well, including silver, bronze or copper. This option is often less costly repair than our Mid and Best level repairs. Best candidates for the Kintsugi style repair are: Far east antiques china and pottery, wood fired pottery, Raku and Bonsai pots or trays. 4) Do it yourself (save 100% of cost) - Because we are also an educational facility, we have created some tutorials for those of you that prefer to repair the broken item at home (DIY) using more commercially available materials. See Several Lessons at different levels with detailed information and illustrations. Outstanding craftsmanship! My Tang Dynasty Fat Lady figurine was shattered into many fragments and has been repaired perfectly. Seamless repair along with a great price and awesome shipping as well as responsive customer service. After taking a once-in-a-lifetime trip to Africa we were thrilled with our purchase of an incredibly beautiful (and very heavy) Shona stone sculpture of an elephant with her calf. Unfortunately, upon returning to the US we opened our find to discover it had been broken in many places; two legs broken off, an ear snapped off, much of the stone had crumbled, etc, etc, and we thought it was ruined. This was despite careful wrapping and packing by us but, undoubtedly, careless treatment by the airlines. After several Google searches we kept coming back to Lakeside Pottery, not only because they were the most responsive but because they seemed lovely people, totally genuine, and enthusiastic and caring of our ‘predicament’, attributes sorely lacking from every NYC studio who were often abrasive, and didn’t seem interested. I took us a few months to get our ducks in a row but we eventually snapped pics of our statue, it was given an estimate for repair and a timetable of the repair schedule. We shipped off our beloved statue in a double box, pampered though it were priceless. We opted for the total restoration, since it really wasn't much more than the next level down. Mort asked us several times why we would consider spending several times its initial cost to repair the piece, so we knew he genuinely cared and wasn’t in this for the money. It was our love for the piece that convinced him we were serious about our desire to have it restored as fully as possible. Long story short, when the elephant statue was finished (way ahead of schedule) we were sent photos of its repair and we couldn’t believe what we were seeing. The, when we received the statue in the 'mail', my wife literally cried tears of happiness when she saw the statue, which was repaired so perfectly, so flawlessly, and obviously with such love and care, we still to this day look upon the statue and are baffled by how they did it. Kudos to Lakeside Pottery for restoring a very sentimental piece we called Grandma's Bird that now looks brand new. My mother-in-law passed away 8 months ago and we are blessed that she had a very strong bond with our daughter. Our daughter just posted "As a kid I always admired this bird and what it stood for....where Grandma would hang her wedding ring nightly. It's just such a strong symbol, I'm so thankful it got a new life and know Grandma will be with me nightly when I hang up mine." Last January an late 18th-early 19th Century Neapolitan donkey arrived from Rome so carelessly packed and shipped,that it was badly damaged. I did get my money back,thanks to eBay and PayPal,but what to do with the broken figure since the vendor had abandoned it. I looked for conservators,but the local one had a 14 month waiting list,others had retired, the conservation department at the State College was uninterested,somehow I stumbled across Lakeside. What a piece of good luck! Morty’s customer service,his attention to detail,his professionalism,is beyond any reproach. He kept me informed along every step of the procedure ,communicating whenever he needed to explain a change of plans,and the results were in kind,that is,beyond all my expectations. The donkey arrived at my home this afternoon. It was such a success,it left me speechless. Looking at the donkey,I could not find a trace of the damage,nothing,and it stands on its own,where once all four legs were broken. I hope nothing like this ever happens to me again,but if it does,I know exactly who to call. In concluding,I heartily recommend Morty and Lakeside Pottery(should be called Lakeside Artistry,) without any reservation. I cannot thank you enough for the professional restoration of my Mother's FTD Nativity figurine. As I had stated in the original paperwork, my Mother died last September, and the figurine was my last Christmas gift to her; which was her most cherished possession. 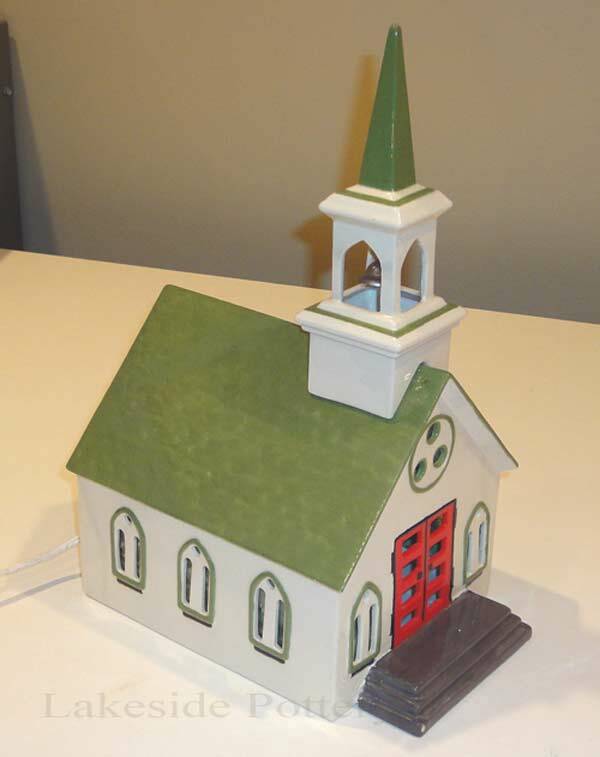 It was given to the crematory with the promise that the figurine would be returned with her urn. It was literally destroyed when the crematory returned her ashes, and the packing of the figurine was beyond careless, allowing the heavy urn to crush it. Even though it is merely an FTD Christmas Floral figurine, you cared for it as if it is a fine museum piece, and restored it to better than new. You understood and respected the personal treasure that was entrusted to your care, and for that I am eternally grateful. It now rests on the top of her urn. I want to thank and congratulate you on the incredible job you did restoring my copper Napoleon bust. The 200 year old bust was in dire need of restoration where the copper corroded through and finding someone who I trusted to do the repair was a daunting task. 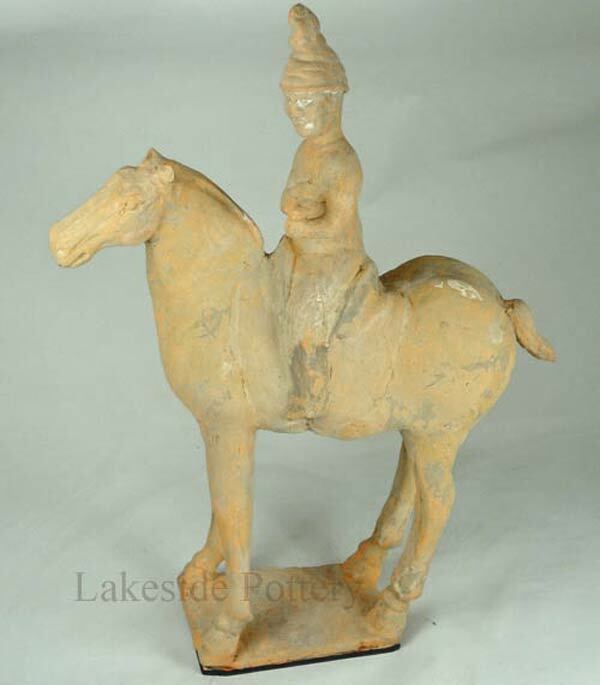 After hundreds of hours researching the restoration of antique art I found Lakeside Pottery. I sent the pictures you requested of the statue and then spoke to you on the phone, I knew that my search was over. The process was exactly as you said it would be. From shipping recommendations up to the work itself there were no surprises. You contacted me half-way through the process and updated me on the actual amount of damage and how you were approaching the repair. I was on pins and needles wondering if the repair would be noticeable because the majority of the corrosion was on the left side of the face -- then the pictures arrived and it was a WOW moment! The photographs were mind blowing. If you didn’t know where the original damage was you could not tell by looking at the photographs. In addition, you sent me 20 images of the step-by-step process to get my Napoleon showroom new. As pleased as I was with the photos, they could not compare to what I saw after unpacking the returned bust. I could not see any seams or unevenness where you filled the removed copper. The color of the patina was a perfect match and you even touched up sections that I didn’t think you would work on. I got the bust from my father, who got it from his father. My Dad only saw the bust in the damaged condition and he was gob smacked when he watched it being unpacked. He told me his Dad would be so happy to see the restored Napoleon and that made me feel great that he was so pleased. Restoring art certainly is an investment that deserves a great deal of consideration. I am glad I took my time looking for the right artists to take on my project. 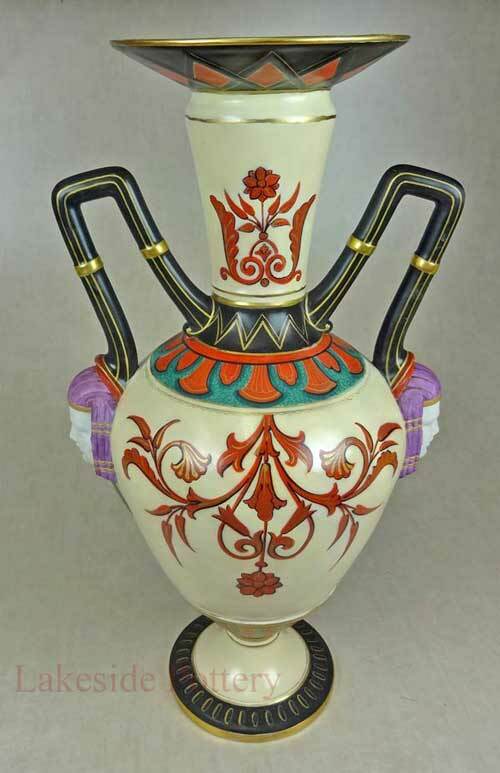 I would not hesitate a nanosecond to recommend Lakeside Pottery for any art restoration. I already have my next project in mind for you! My sincere thanks for your restoration skills and artistic skills. When the bowl we had hoped to purchase was already sold, Morty not only suggested other similar options but included a group of photos for us to look at. We wanted some additional info and Morty provided it immediately. The entire process from beginning to end was a genuine pleasure. I felt like I had "met" someone I would really like to know. From scanning the reviews I note that my experience was hardly atypical. We are so happy to have discovered Lakeside Pottery Studio. 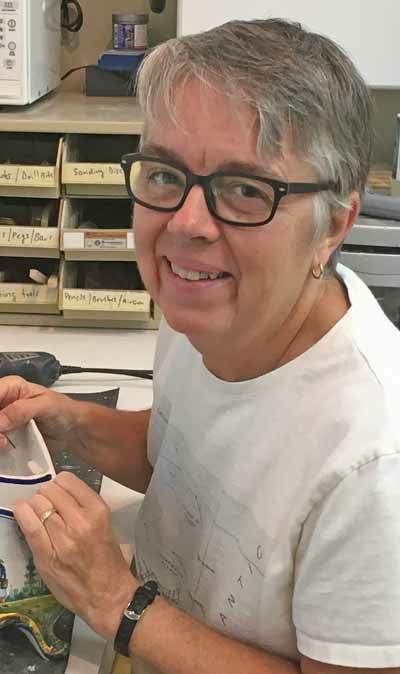 Morty & Patty have literally worked miracles when it comes to repairing & restoring our treasures. Their work is above and beyond our highest expectations!! 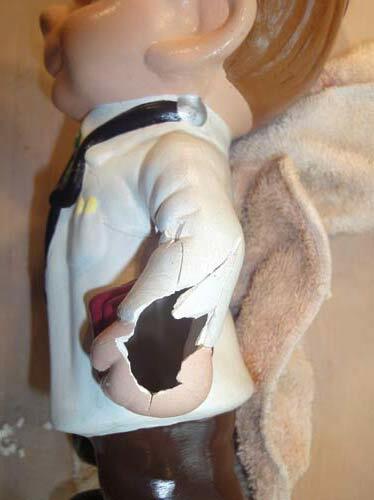 During a move for my daughter, I was responsible for breaking a Jessica Rabbit statue in half. It had not only sentimental value, but is almost unobtainable (it was bought over 10 years ago and was done by a minor artist just for Disney). 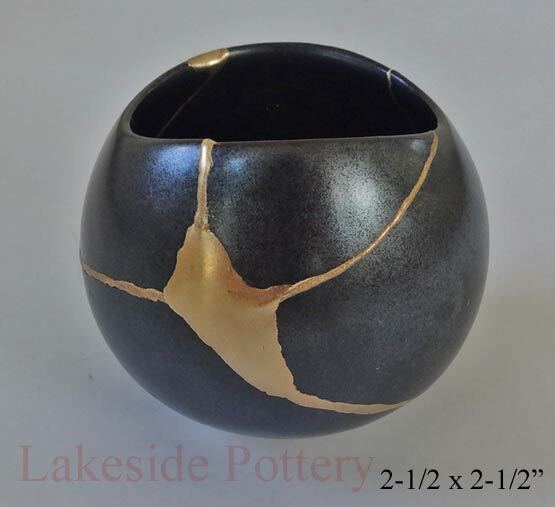 In searching for places that could repair them we stumbled on Lakeside Pottery's website and were very impressed. We decided to go with them, and we just unveiled it two nights ago for my daughter, who had no idea we were going to get it fixed. All present were amazed! We all looked to find telltale signs of the repair, but when we compared the original break to the statue, there was just nothing to find! An amazing job. I wish we could put before and after pictures here on Yelp. Talking with Morty was a great pleasure as well. I cannot recommend them more highly. Hello Patty and Morty, The ice cream server just arrived. What you have done is amazing!!!!! All the pieces fit together perfectly, which is incredible when you realize you did not have the companion piece as a guide. The painting and glazing make the reconstruction virtually indistinguishable from the sister piece. Check out the photo of the two side by side. You cannot tell which is which. Amazing! Thank you so much. I received baby Jesus today when I came home from work. He is just perfect. Oh my God. Thank you for your blessing to me. I'm so happy. Wow! How did you do that? It looks phenomenal! I am smiling from ear to ear! The timing will be perfect as my son’s birthday is at the end of the month. I can’t tell you how grateful I am to you Morty (and Patty)! Alison's Mug - Just a note of thanks - Alison's Princess Leia mug is beautifully repaired. One of my pre-columbian statues and an African Ashanti ceramic statue were shattered. I brought them to Lakeside Pottery and Morty suggested several possibilities for restoration. I took his advice and the results were amazing. The pre-Columbian was restored as a museum would have done it and the Ashanti completely restored. Admirable work. Many years ago I had a specialist who worked at the Boston Fine Arts Museum restore several statues. Lakeside Pottery was just as good. I would recommend their excellent work to anyone. John D.
These guys are terrific. And rightfully happy and almost ecstatic in their work fixing something as good as it was before it broke. I shipped them several 3" tall, broken ceramic soldiers, matching the pieces with the larger parts as best I could. But they were small to begin with and the pieces were tiny.They quickly called me and asked whether I might have overlooked some pieces as most were there but a couple of tiny ones were missing. I went and did a search of the closet where they had fallen and broken and, sure enough, two or three very tiny pieces were still there. I sent them off to Lakeside and they were reported those were the missing ones and the repair was beginning. In a couple of weeks---maybe a bit longer--- carefully packed and shipped, they arrived back to me. The work they did is absolutely perfect, in paint repair, and structural repair. Truly remarkable. A true professional! From my initial phone consultation where he detailed exactly what he could do, to offering detailed shipping information (I live in Las Vegas), I have been completely satisfied! I opted for his best work and when my Boehm Least Tern sculpture arrived, I was ecstatic at the quality of the finished piece! It now looks as though it has just come from the Boehm Studios. I am making Lakeside Pottery my only porcelain repair studio. Thanks. Morty and Patty are extremely friendly, competent and talented. My cousin sent me a family heirloom from California to Connecticut, a plaster bust of my great grandmother sculpted by my great grandfather. She shipped it UPS ground and the base and neck shattered/crumbled during the journey. I was heartbroken when I opened the box. 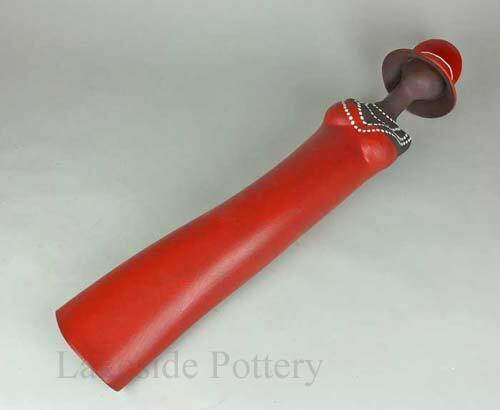 I searched online and found Lakeside Pottery. Their website shows many before and after photos and they did not disappoint! The plaster bust looks like new and they did it all within a couple weeks. I can't even tell it was ever damaged and they even put a reinforcement coat on it to strengthen it. I would HIGHLY recommend them to anyone. Morty called me throughout the process to give me plenty of options and to keep me abreast of his progress. It was great doing business with them!!!! They are miracle workers! After obtaining my estimate, a broken ceramic figurine with huge sentimental value was sent to Lakeside Pottery. The repair was done in half the time estimated (said it would take up to 60 days; received in 30 days). I was amazed it when I saw it in person. I can't believe it was the same broken piece. I highly recommend this company and their incredible craftsmanship. Just received the SECOND piece you have repaired for me and it is PERFECT! I cannot thank you enough for taking another piece of my childhood and restoring it to perfection. Your service, communication and work was exceptional THANK YOU!!! My grandma passed away a couple years ago and the only thing I have of hers is a ceramic Raggedy Andy cookie jar that she painted. I recently took the cookie jar down from the shelf and I noticed she put her initials and date on the bottom of the jar just a couple days before I was born. Within seconds of seeing this, I dropped the top of the jar and it shattered into pieces! As you can imagine I was beyond myself! Once I pulled myself together I immediately did a Google search and Lakeside Pottery kept coming up. I completed the form, received an estimate and sent the jar to them. Within days Morty called me to tell me that it was going to cost a little bit more, but they had some options.Instead of repairing the jar, I ended up finding the exact same one on Ebay and sent that to Morty. The painted it the exact same way to match what my grandma had done and got the top to fit the base of the one with my Grandma's initials and date. When I received it back it looked exactly like the original. Throughout the entire process Morty kept in contact with me and was very understanding of the sentimental value of the cookie jar. I would use this company again in a heartbeat! Their compassion, professionalism, and detail of work is one you don't often see anymore. Thank you Patty, Morty, and Lakeside Pottery!! 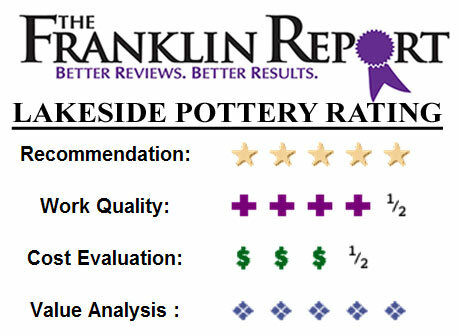 I have nothing but positive things to say about my experience with Lakeside Pottery. Communication was excellent and very timely. The repair work on my two ceramic mushrooms was perfect. After the repairs, there is simply no evidence of the prior damage nor the repair work. I could not be more pleased. My wife inherited an old Della Robia style Italian disk that her mother had for many years with a lot of sentimental value. I had never really seen it up close, but it had been very poorly repaired at some time in the distant past with glue showing on the front and back. I sent it off to Lakeside for restoration and it returned in fabulous shape. There was no visible sign of the old repair and it looks great. It still looks like the antique it is, but the difference in appearance is amazing. I was very happy with the estimate of time to repair (which they beat by several weeks) and the logistics of shipping there and back were just what was advertised. A great experience overall. Absolutely perfect, a miracle. These folks deserve the highest credit for their service and quality. Morty did not laugh, at least directly to me, at my terrible repair attempt ! 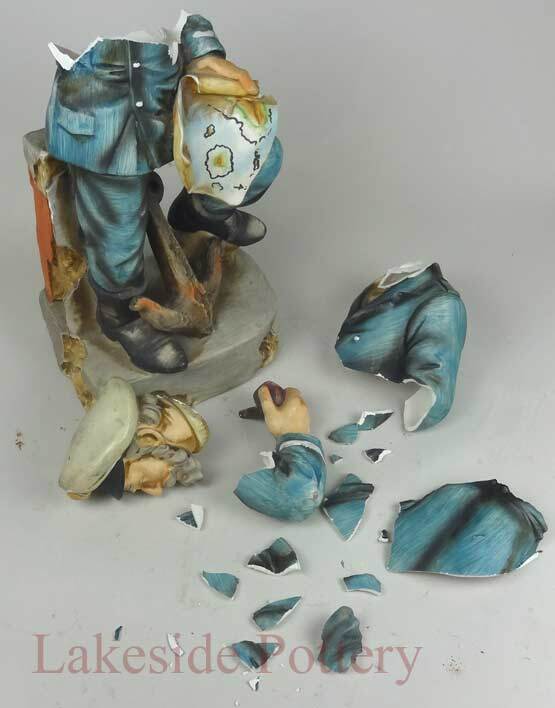 My wife bought 3 sculptures and unfortunately I broke two of the 3 men, each in many pieces. Lakeside pottery put them back together so they could join their brother. The repair exceeded my expectation in every way. Now it is impossible to tell which 2 were repaired. I am truly impressed and grateful. I would highly recommend Lakeside Pottery. The owners, Morty and Patty were professional, knowledgable and wonderful to deal with. I entrusted them with restoring a Blessed Mother statute that belonged to my grandparents. There were cracks, chips, and pieces missing as well as needing paint restoration. It is a least 80 years old. The workmanship is top shelf. More importantly, after explaining the job online, Morty called to walk me through the process and was completely honest about the procedure and the cost. There were no surprises. I couldn't be more pleased with the results. Lakeside Pottery restored a family heirloom and I will be eternally grateful! 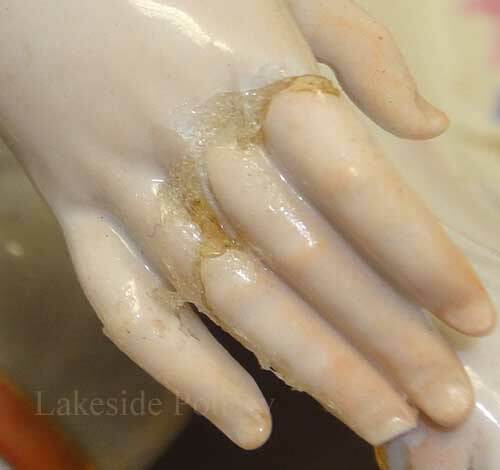 I engaged the services of Lakeside Pottery to repair and restore several rare and precious antique porcelain figurines. I am delighted with the high-quality work that they performed for me. 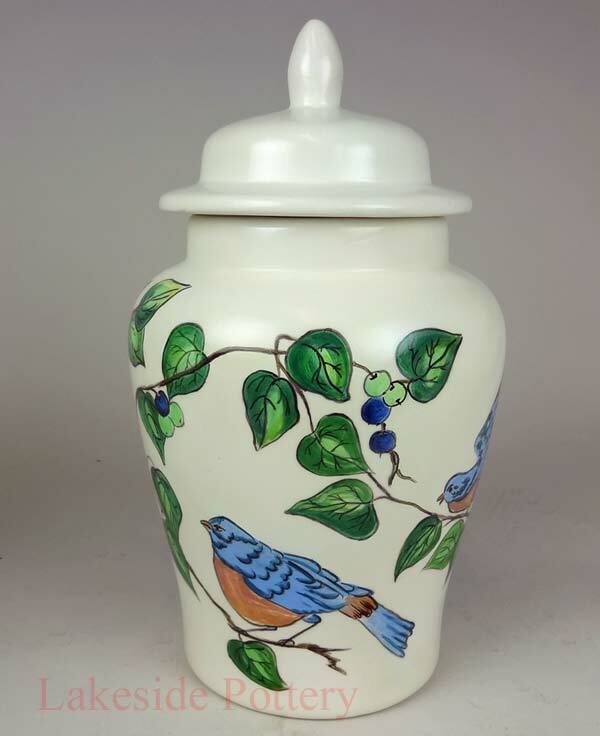 Lakeside Pottery perfectly filled in gaps and recreated missing porcelain pieces, flawlessly matched original colors and glazes and expertly reproduced very fine hand-painted details. The repair work is undetectable and is of high-level museum quality. My figurines now look brand new; one would never know that they were previously damaged. And for this, I am so very grateful. I recently sent Lakeside Pottery an Italian antique ceramic table top that had been broken in several places. I found Morty to be very friendly and knowledgeable. He explained the various levels of repair that I could choose from. For various reasons, he recommended a lower level of repair rather than a more extensive and expensive level. When I received the table top back, I was delighted to see that the repair was of excellent quality. I highly recommend Lake Pottery! My wife and I bought a piece of pottery when we were engaged. The fragile piece was knocked over an broken into dozens of pieces. We never thought it could be restored. Lakeside Pottery did an amazing job, exactly matching the tint and color everywhere. You can't tell it was ever broken. We now have this very meaningful piece back in our home, thanks to the craftsmen at Lakeside. Morty and Patty are great and are highly recommended! I was heartbroken to discover that three of my figurines were damaged during a recent move. I believed that the figurines were damaged beyond repair! After an exhaustive search, I discovered Lakeside Pottery! Absolutely a fantastic experience! They expertly restored my figurines to their original state. Quality workmanship and even better people! They are the "go to" Studio for Resin and Porcelain restoration! Lakeside Pottery recently restored a beautiful family heirloom of ours after it was broken in a move, and the results from their work were spectacular. My husband inherited a gorgeous, green, glazed ceramic terra-cotta Chinese Tang horse a few years ago (made in Italy), which had been purchased by his grandmother in the early seventies. It measures 5"w x 16"h x 5"d. It was heartbreakingly broken into five pieces (mostly at the legs) during our move. I originally thought that we would be able to purchase a similar item on the Internet to replace it, but I found nothing that came close, probably because it is really a unique one-of-a kind work of art. 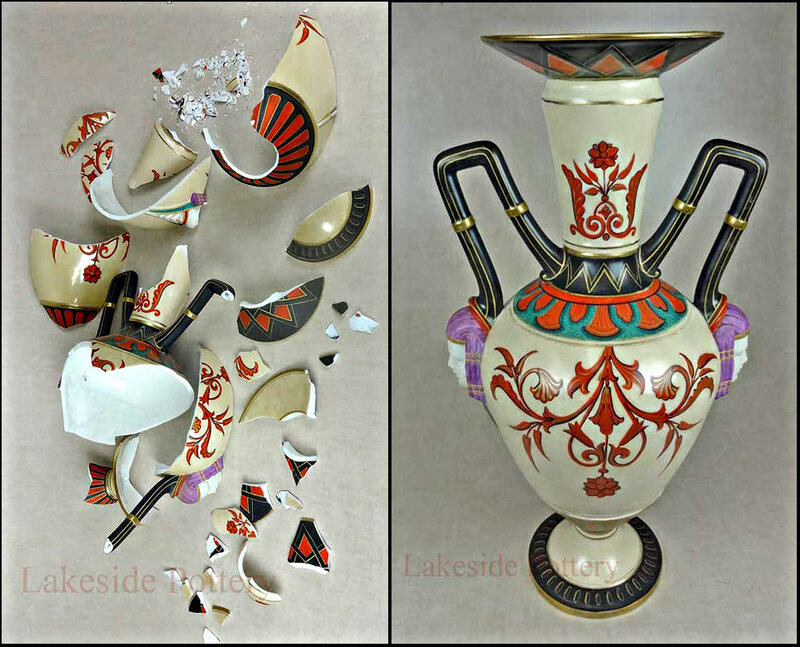 During my Internet search I found Lakeside Pottery and was thrilled to learn that they restored broken works of art including those made of terra-cotta. I contacted them and spoke with Morty, and immediately felt confident that he would be able to repair our precious horse. I sent them the horse (they are located in another state), and when it was returned we were completely delighted with the results. Truly amazing work. You can see no damage whatsoever, and it was restored to look even better than it looked originally. We just love it. We have our horse in a place of honor in our home and tell the story of how Lakeside fixed it to everyone who comes to visit. I would highly recommend Lakeside Pottery. They do outstanding work and are a pleasure to work with. We had a beautiful large Raku piece which broke in many places. Morty and Patty were up to the challenge. They repaired it perfectly. You would never know that it was so severely damaged. And they were a pleasure to work with. I highly recommend them. As a rule, I would ordinarily have done a great deal of research as to who would be able to restore a cast iron sculpture back to its original glory. While I made a number of calls to other companies, I was instantly impressed with Morty. After speaking with him, I felt more than confident that he had the knowledge and skills to do the repair. I could not have been more pleased! So much so that I brought 2 more sculptures (wood) that needed repair. He and Patty do first class repairs. They take the time to explain the process and follow through for a perfect restoration. They repaired three old family porcelain pieces, in one case recreating a porcelain hand that had broken off a figurine. the pieces look brand new. I've never seen such meticulous work! Highly recommended! 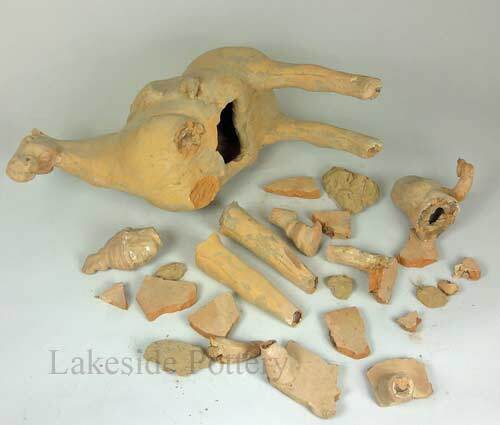 I found Lakeside Pottery searching on Google for a ceramic restoration company. I had a Hummel Madonna that was in need of repair. I contacted Lakeside on their website and from then on it was an easy go.I was well informed with the process and every communication with them was timely and efficient. Patty & Morty were friendly & easy to work with. Most importantly, the restoration of the Madonnna is perfect. You cannot tell it was repaired. Without a doubt, I would use them again for any restoration. I could not be happier about the work of the folks at Lakeside Pottery. The customer service was great and the results remarkable. They did an amazing restoration of my wife's very damaged, cherished childhood heirloom. Terrific company, nice people and spectacular craftsmanship. These people are miracle workers! I had cracked 2 pieces off the end of tray that I loved, and the original artist no longer makes it. I got a reasonable estimate from Lakeside, sent it off, and it is indistinguishable from the original! Amazing! They couldn't have been more helpful or more professional! They gave me a quick and accurate estimate based on a photo of my piece. (Which they made easy to submit). When I sent the broken bowl to them, they called me and suggested a different type of repair that would look better. They were very sensitive to cost issues. They kept me informed of the status of my repair, and notified me when they sent it back. All of their instructions were clear and complete. I am a big big fan, I almost wish I had more broken pieces for them to fix. I wish more businesses would be run this way.The end result was beautiful! 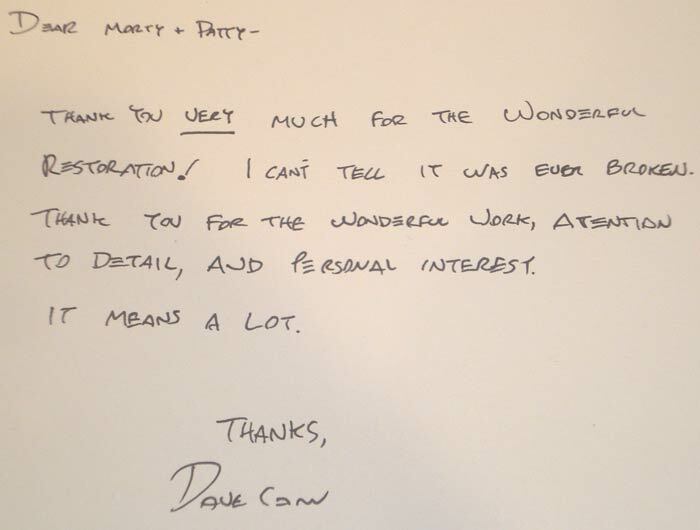 It became abundantly clear early on how very much Morty and Patty care about the quality of the work they do as well as providing satisfaction to their clients. They were quite straightforward in explaining the economics of the repair we were requesting and my family and I are so very, very happy with the decision they helped us make. The results of their efforts in repairing a family heirloom statue were superb and exceeded our expectations in every respect. My experience with Lakeside Pottery has been exceptional. I have taken three pieces including a terra cotta church from Indonesia; a very old Columbian warrior; and recently an Egyptian statue - all that had been badly broken. In every instance they were able to repair the pieces so that you could not tell they had ever been broken. And they did this in a very timely manner and at a very reasonable fee. I strongly recommend Lakeside Pottery with no reservation. I have this ancient Maya pottery figure of a solemn-looking Mayan King with his coca-leaf inside his cheek...Loved the piece-but it broke into several fragments. Morty and Patty restored it beautifully and one cannot tell it had been so badly damaged. I'm so very grateful that I now have this piece for my grandchildren to enjoy one day...and I'm enjoying it right now! 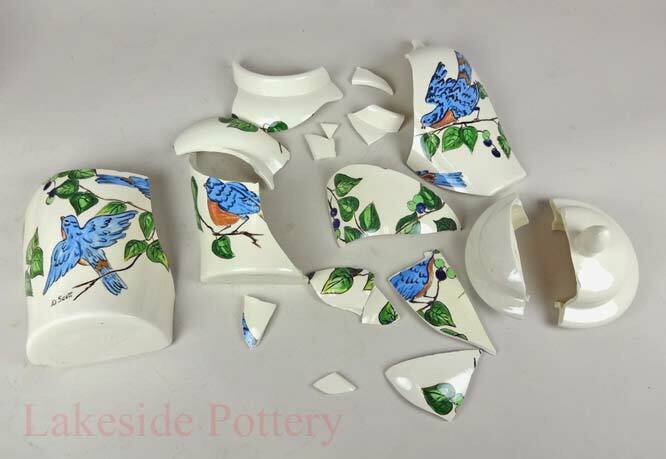 We were so happy with the repair service to our piece, Lakeside Pottery is a true gem find. You would never know our piece was repaired. The owner was wonderful and so knowledgable and helpful. No need to go anywhere else. They are exceptional. Inherited my Great Grandmothers 1885 tea set. However in the move the tea pot was broken. They are very interactive and concise about what they need to give a quote. I never expected to have to pot restored to a point that you can't tell at all. IT is worth every cent paid... They are AMAZING ARTIST... Thank you Morty and Patty you are gems at your craft. Hi Patty and Morty, things have been a bit stressful for me as you can imagine since being back home but I wanted to let you know the lids arrived on Thursday. They are perfect in every way. I could not have asked for anything more. Im looking at them now back on their bases and im just so happy that you were able to restore them back to perfection. I think you know how much this meant to me and in light now of losing both my parents during this time it means even more. UPS delivered my treasured owl about 7:00 PM this evening, and we just opened its shipping box after having a late dinner. The owl arrived unharmed as expected. Your packaging is always perfect. OMG, Just when I thought I couldn't be any happier than how I felt seeing the owl restored in your photos for the first time, I was wrong .. soooo wrong! The owl looks even more spectacular, more beautiful, and more stunning than it ever did! Reason being, the way you smoothly and softly transitioned from one color to the next on the lamp's leaves, is amazing and perfect! I remember seeing the leaves original painted surface before the lamp's restoration, and the artist who painted it didn't have the gift of being able to smoothly shade from light to dark and gently transition from one color to the next the way you did. The leave's original paint had a choppy and sharp color-change transition. Another improvement you made to the original was the flower pedals. They now look smooth, soft, and they have a more realistic appearance than the original. So, you actually improved on the original and nobody but you and I will ever know the difference! I just cannot get over how utterly fantastic the piece turned out! I never imagined the repair to be so spectacular!! Every leaf and every flower pedal looks like the original but better in its construction, paint, and artistry! Our Church's life size statue of Mary had extensive damage to it after it had fallen. Thankfully, we found Lakeside Pottery to restore it. They sculptured new hands, repaired the many broken areas and repainted the entire statue with it's many details. The restoration was remarkable! It looks beautiful! I would highly recommend them and would not hesitate to use them in the future. They are professionals, and do outstanding work with great attention to details. Thank you, Arlene, Wolcott, CT. 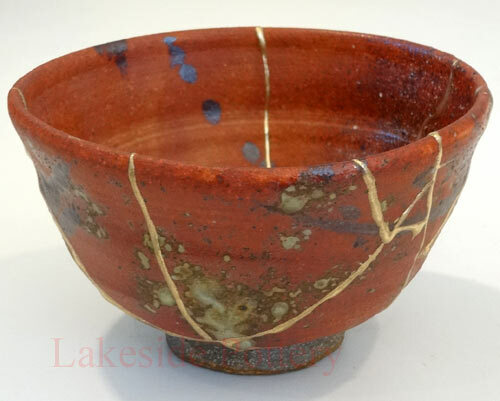 The kintsugi bowl has arrived in perfect condition - it is simply gorgeous! It is so beautiful it brought tears to my eyes – perfect!!!!!!!!!!!!!!! Thank you! In fall 2012, I took a life-changing trip to multiple countries throughout Africa. It was my first time in Sub-Saharan Africa and words really could not describe the emotional and intellectual enlightenment I experienced on this trip. I say this only to emphasize the importance that many of the souvenirs (primarily artwork and statues) had for me. Some items were for my personal collection and others were gifts for family, close friends and important clients. Before departing South Africa, we packaged several stone statues and made arrangements for Fed-Ex to ship back to the US. What we learned after the fact, is that customs and Fed-Ex are required to search large packages to ensure that they do not contain contraband. All of the items were unpacked at least twice during shipping and not re-packaged in their original form. Six of the statues arrived to the US shattered in numerous pieces. Heartbreaking would be an understatement. Fed-ex immediately agreed to waive the shipping and reimburse me for the cost of all of the items, but this obviously did not alleviate the massive disappointment. 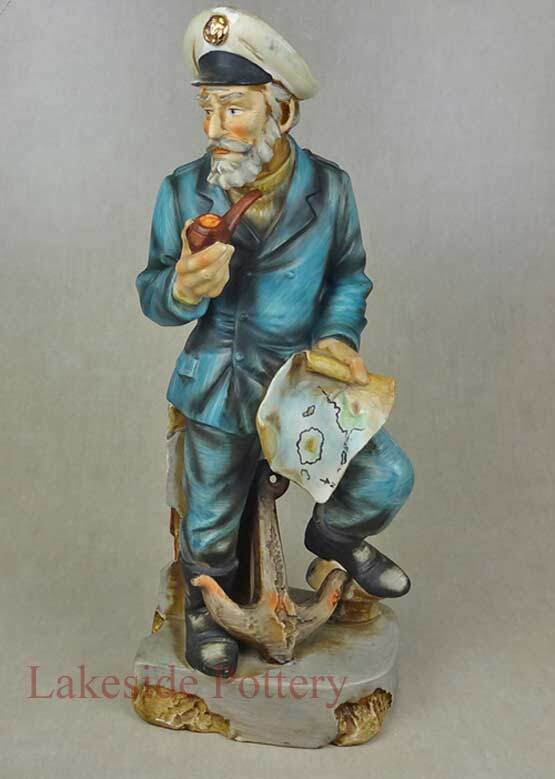 I searched for a statue restoration business in greater New York as a long shot hope that someone might be able to get the statues to a presentable form at a somewhat reasonable cost. 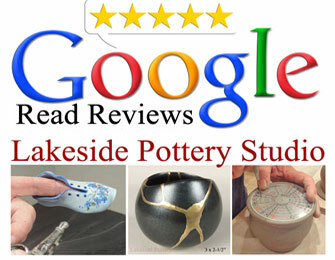 We found Lakeside Pottery which had high reviews and impressive testimonials. I selected three statues (that had the most importance to me) to have repaired. I was doubtful that the team at Lakeside would be able to work a miracle, but they did! Three times! I am blown away that they got the statues (each broken into 15 pieces or more) into a state that really looks better than new. Effort and professionalism are oftentimes is a dying art, but not at Lakeside. These guys are pros and they really do work miracles. Lakeside fixed an awful situation and I find it hard to imagine that there is any project they would not be able to handle. I have a teapot that was given to me by my now deceased mother. 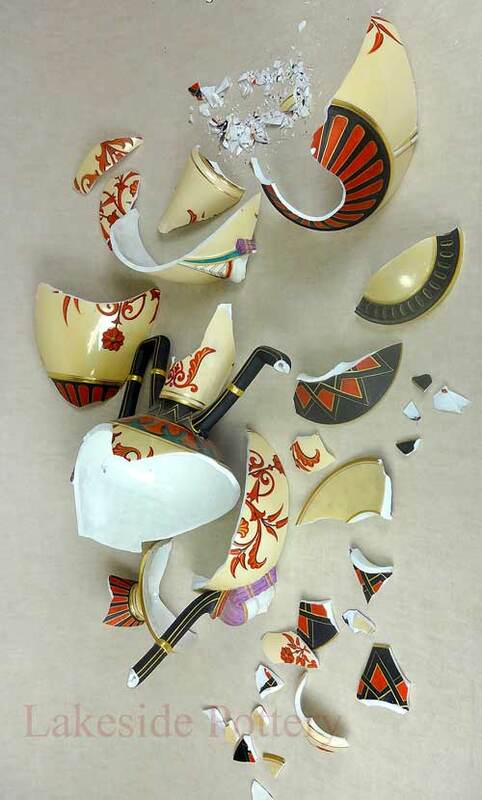 The handle of the teapot was shattered by an accidental bump. After months of searching for someone to repair the handle I found Morty and Patty at Lakeside Pottery. The repair is invisible and the teapot is like new. No one can tell that it was ever broken. I am so pleased to be able to look at my teapot and remember my mother. Thank you Morty and Patty for the time you took to repair my teapot. Barbara M.
Morty and Patty, ‘Just wanted to send a short not to tell you my trivet arrived last week  you did fabulous restoration work on it!!! Even the backside looks perfect! I very much enjoyed doing business with you  you were not only a pleasure to deal with, you were prompt with an estimate, prompt in turning the project around and prompt in getting the piece back to me. A lot of businesses could use a lesson from the two of you  you make a great team! Again, many thanks. Kathleen P.
I had a vintage piece of Mexican Folk Art (a large ceramic pitcher) designed by world famous artist repaired by Lakeside Pottery. The pitcher arrived by air freight broken, and appeared to be beyond repair. Four large sections had broken away and had to be reattached to the pitcher. The repairs had to be structurally sound, and the various surface textures, colors and patterns matched so they blended with the undamaged surfaces. The repairs required a number of skills, an understanding of the historic nature of the art, a knowledge of structures, materials, and painting----- skills that Lakeside applied to the restoration. 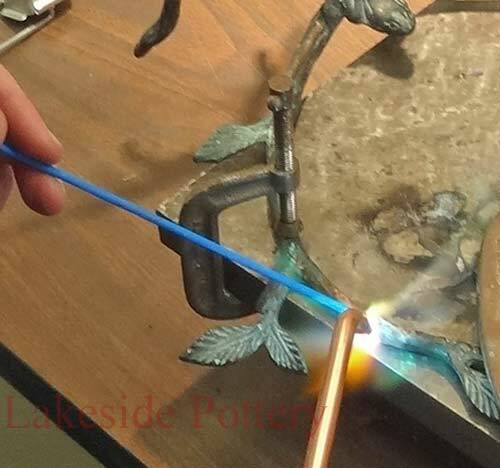 Lakeside made a thorough examination of the piece before doing any work to determine how best to repair the damage. In doing so they found that the piece had been previously repaired, and were able to correct it. Once it was determined that the pitcher could be repaired and the best way to do it, Lakeside explained the process in great detail, how long it would take and what it would cost. In the end there were no surprises. The work was expertly done and when finished the pitcher was stronger than it had been, and the repairs could not be seen or felt when running your hand over the surface. This is just one example. Lakeside has repaired 6 other pieces of ceramic Mexican Folk Art for me, each with a different set of challenges and in each case the repairs were flawless. I cannot thank Patty and Morty at Lakeside Pottery enough for the incredible repair work they did for us. After spending a week in Morocco trying to find the perfect antique for our home, we were so excited to return to New York with a piece we just loved. No carpets or magic lanterns for us, we had found a gorgeous antique ceramic Tagine with beautiful silver and stone detail. So you can imagine our devastation when we opened up the box it had been shipped in and found it very, very broken. Whole chunks of ceramic had chipped off, and there were deep cracks, well, everywhere. We thought it was going to be totally hopeless to fix it, and the more we called around to restorers in New York City (who either didn't call us back or quoted us astronomical prices to fix it) the more discouraged we became. 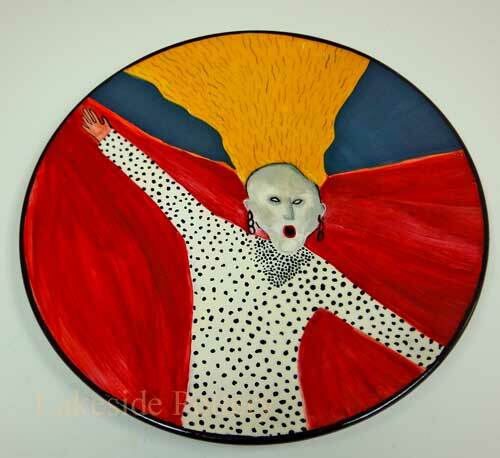 Then I came across the website for Lakeside Pottery. I immediately had a good feeling. Patty and Morty were very responsive right from the outset - they returned my phone calls and emails quickly and were so kind and honest. They gave me a very fair estimate based on the photos I sent and were very communicative throughout the process. When the tagine arrived at their studio, Morty called me to let me know that the damage was far worse than he'd been able to see from the pictures. Basically the whole thing was shattered and being held together by the intricate metal work. A total disaster. Without taking the whole thing apart (which would cost thousands of dollars we didn't have), it would be tough to really fix. I started to panic. Don't worry though, Morty said, he had a plan. Well, his plan worked! Over the phone, Morty took me through exactly what he was planning to do to fix it, he was so good about keeping me in the loop and making sure I understood the process. I was truly shocked when only a short time later Morty called me to tell me he'd be shipping it back to me restored. We couldn't believe how fantastic it looked when it arrived. I had assumed that no matter what we'd always be able to see the cracks where it had been shattered, but the way he fixed it you'd never be able to tell it had broken in the first place. And while I'm thrilled that they were able to repair the tagine so well, I'm equally thrilled at what a nice experience it was. What could have been a stress, nerve-wrecking experience ended up being a truly lovely one! Now the tagine is prominently displayed in my home and everyone who sees it just raves about it. While I hope not to have too many more antiques break in my future, from now on I won't be quite so devastated knowing I can send them up to Lakeside! I highly recommend working with them . Thanks Morty, That was a terrific job on the Picasso vase. It looks great! I am still astounded by the quality of the repair work done by Patti and Morty. I really thought the item I sent them was a goner! I should also mention that Morty kept me informed every step of the way and was totally delightful to interact with. I am even thinking of breaking some other items so I can have the same experience again! These folks are the BEST at what they do. We had a piece of pottery with great sentimental value that was damaged during our recent move. 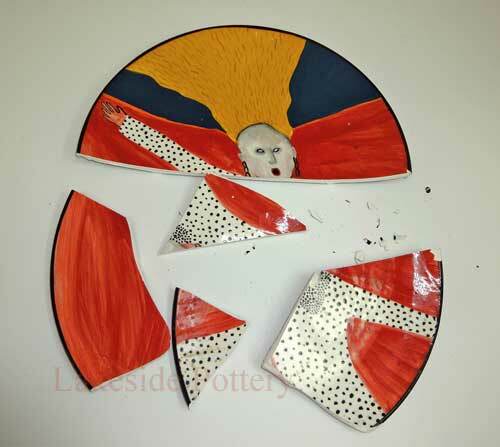 We are so happy to have found Lakeside Pottery to repair the piece. From our initial inquiry to the final delivery and follow-up phone call to check on our reaction, Morty was a joy to work with - prompt, courteous, and clearly passionate about his craft. We chose the Kintsugi repair technique and the results were stunning -- our pottery is newly and differently beautiful, its history of adversity brilliantly illuminated by golden seams. Before: "My grand daughter broke my father's 12 inch fruit platter, which he bought with my mother when they first got married 55 years ago, and I would like to have it restored." After: "Wow, that is truly unbelievable. It brings tears to my eyes. Like I said, it has mostly sentimental value, but it wasn't until it broke that I actually noticed I also found it beautiful. Michele"
Thanks so very much!! The dish looks amazing thanks to your talented repair. Thanks again for fixing it so quickly!! Morty from Lakeside Pottery repaired a small saltbox for me that had strong sentimental value. It had belonged to my parents and had some historical value as it is labelled "Made in Occupied Japan". Restoring a lid to a pot. "Hi Patty and Morty, I received the lid and it looks beautiful! I can't thank you enough for doing such a wonderful job. I appreciate your expertise and also your kindness. Thank you so much. Carol"
Restoring Josefina Aguilar Ceramic Sculpture. 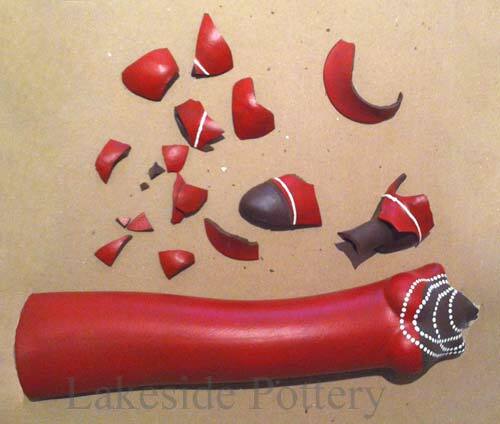 We recently had two large clay figures repaired at Lakeside Pottery. They were made by the world famous Mexican Folk Artist Josefina Aguilar. The two figures each 30” high were quite heavy and though professionally packed broke in shipment. The repairs required reconstructing complex shapes that had broken off the figures, adhering them to the body, and painting them to match the original colors. In addition a 10” long hairline stress crack up the back of one figure needed to be stabilized. 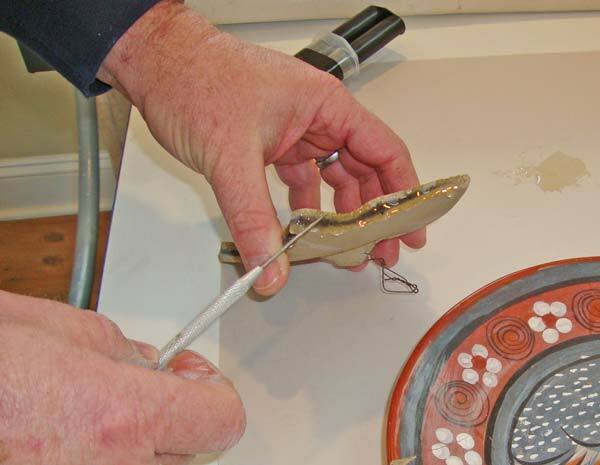 To reconstruct the broken pieces, Lakeside Pottery used both primitive techniques employed by the artist, and cutting edge technology such as high strength adhesives, fiber and fillers. Using only materials that would not damage the art work, they restored the broken pieces so the repairs were stronger than the original clay construction. All the work was done with great care and expertise and when finished the repairs were invisible to the eye and touch. It was a pleasure working with Morty and Patty. From the outset, they explained their process in detail and kept us informed of their progress completing the work on time as promised. 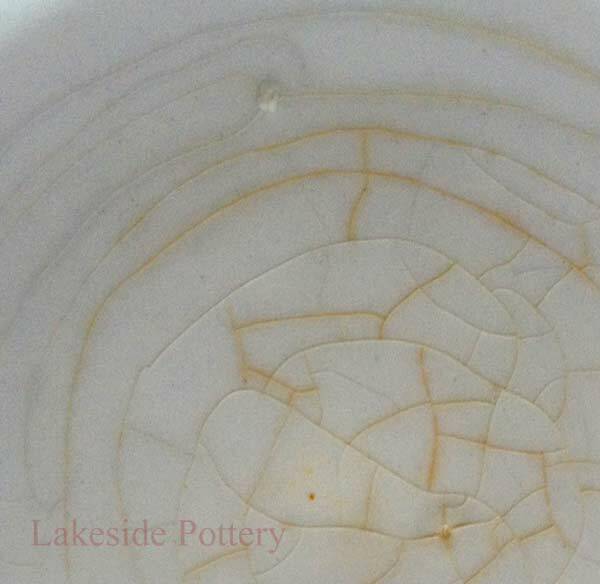 If you are looking for a museum-quality ceramic repair shop, Lakeside Pottery can provide that service. Restoring broken vase. "Dear Patty and Morty - Thank you for the vase - she is absolutely beautiful! Arrived yesterday on my doorstep. What an incredible restoration - unbelievable! I am having a photographer over tomorrow to do a photo shoot for my website and I will include the vase in a vignette on website. Will be sure to send pic your way. Again, heartfelt thank you!!!!" Restoring broken vase. "Wow!!! .... I am excited! Guess what the best part of the pic was? It's what drew me to the vessel to begin with. The claw marks from the reptile crawling up side of it which are still in tact! I love the color the way it is. Shows character. Perfect. Anything without blemishes is not real. Let's just say that your very timely email made me a very happy woman. Therese."